This was one cool elevator. Not that we’d noticed at first. Because even though the exhibits at the Museum of History of the City of Luxembourg (located, yes, in Luxembourg, Luxembourg) begin on the first floor, you enter on the third floor, and we’d walked down the stairs. Once down there, however, we crossed through the chamber into which the elevator delivered its passengers. The elevator shaft is stone. The elevator, itself the size of a small room, is made of, and fronted by, glass. That means you can look a long way up the shaft. Turns out, you’re standing inside a medieval vaulted fortress cellar and that elevator is rising through bedrock. The same bedrock into which Count Siegfried built The Luxembourgian Dynasty’s castle in the year 963. You don’t necessarily realize any of this when you enter the building. Its front door—a huge glass facade—connects three antique houses on the narrow, cobbled, Rue d Saint-Esprit. You think you’re going into a modernization of some old houses. Not a fort built into a canyon wall. We pondered where we stood. It was some kind of matrix for modernist, 20th century architecture and 10th century engineering. A museum that depicts the history of a foreign city may seem like dry stuff for kids, even kids who like rocks, forts and castles. But, the building alone captures their imagination. Add a series of remarkable, unpainted, carved wooden models depicting the city’s various stages of development, mixed media to tell its story, and one great elevator ride through the rocks, and the kids are hooked. Luxembourg started as a village at the bottom of a gorge-like valley where the rivers Alzette and Petrusse meet. That 230-foot drop from the plateaus above afforded natural protection, and it was into the cliffs’ sandstone walls that Siegfried built his fortress. He called the fortress Bock. And, you can still sneak around in Bock’s "casemates"—tunnels cut through the cliffs that ignite any child’s imagination. "Modern" Luxembourg, which is to say anything that dates from about the 17th century on, was built on the plateaus above the rivers. The city's historic Centre Ville is a tangle of narrow streets. Today these old-time lanes hold a variety of shops ranging from trinket marts to high-end retailers, along with a seemingly endless supply of restaurants. Centre Ville is anchored by a pair of plazas, the more important of which is the Place d’Armes. Bordered by eateries ranging from MacDonald’s to fine dining, most with outdoor seating, Place d’Armes makes for fine people watching. We lolled here often during our too-brief stay, sipping drinks and listening to outdoor concerts offered on a small outdoor stage. "I’m not walking across this bridge again!" I declared as we walked the Viaduc for the fourth time. Sorry, but I’m just not fond of heights. But, it’s easy to want "just one more photo" from that lofty perch. It’s an excellent site from which to admire and photograph the cliffs and old ramparts above, and the Grund below. Grund sounds like ground, eh? And that’s what the Grund is—the village at the bottom of that gorge. The streets leading to and from it rise and fall at leg-straining angles. As do the stairs that rise from and descend at different points. But, not to worry. A pair of free elevators flank Viaduc, one of the two main bridges that link the older Centre to the newer Gare section of town. And, speaking of elevators—the tunnel at the bottom of the northern one holds an impromptu art gallery. 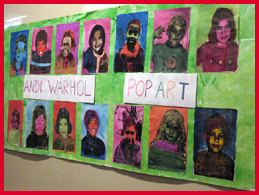 It was filled, during our visit, with kids’ interpretations of Andy Warhol paintings, including self-portraits and portraits of their pets. What a great idea. You can ogle these views from Viaduc. Or you can take in ever-changing perspectives from the promenade that runs along the gorge’s northerly flank. My acrophobic knees knocked nervously at every promontory or overlook. But, I’m glad I persevered. And, why, I asked myself, were none of the kids we saw clambering along the ancient walls and ruins, nervous about these heights? Perhaps they were having too much fun. Yet, when we stood on that promenade and looked out over the remainders of the original fortress, or we ogled trains rumbling over distant stone bridges, or we visibly ferreted out a Middle Ages bit of rubble or remains, fear of heights seemed a small price. We’d innocently gone strolling in Parc Ed Klein in hopes of walking off the enormous breakfast we’d devoured at the Hotel Parc-View, our home for three nights. The park sits just across the street from the hotel, but the way in which it loops and curves around the city core had us walking in semi-circles when we thought we were moving straight. Just as we were growing desperately disoriented we stumbled upon a pirate ship, a multi-tunneled, two-story covered slide, a collection of wild animals (alligators, hippos, oh my! 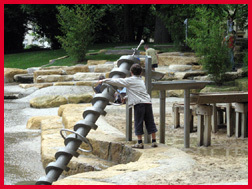 ), sand boxes, swings and a maze of waterplay installations. If ever there was a child's reward for being toured around an ancient city, this was it. Heck, a parent's reward, too. Riding in different vehicles can also be a kids’ reward. Luxembourg has no subway or trolley lines, but it has plenty of busses. Indeed it holds a Tram and Bus Museum. We rode the number 18 bus to a strange glass-and-steel forest of modern office and government buildings that’s rapidly growing more glossy buildings. Kirchberg-Plateau. Kirchberg-Plateau is home much of the European Union's business offices, and other sizeable enterprises. We were there to see the new Musée d'Art Moderne Grand-Duc Jean (MUDAM), and to look at the modernist Philharmonic Symphony Hall. Yes, contemporary art often causes us to wonder aloud, "Yes, but is it art?" But, modern art fuels kids’ imaginations. They're not worried about aesthetics. Coolness, silliness, differentness, oddness—whatever. They’ll find something in it. MUDAM was between major exhibits that day, but the new pieces that were being installed clearly bespoke an outer space theme. What kid wouldn’t love a roomful of ETs? And, even though there was no concert at the hall, its forest of white cylindrical pillars flanking the circular building are perfect for playing hide and seek. Indeed, Luxembourg, Luxembourg, may be the perfect hide-and-seek city. It’s certainly a gem hidden in plain sight smack in Europe’s middle. It’ll surprise. It surprised us. 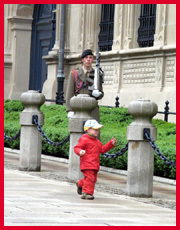 Free concerts at the Place d'Armes fom April to September. General Info: Luxembourg Tourism. Luxembourg City Tourist Office.